We are transforming a weedy area of creek bank in Civic Park into a meadow of wildflowers and native grasses. This season's work started in January -- we're cleaning up weeds and planting new seedlings. Join us for some rewarding work, camaraderie, and sometimes a brief talk about an aspect of creek ecology. No experience is required -- just a desire to make the creek a better place for both humans and wildlife. To sign up for an event, contact us. The first phase was to map the arundo. 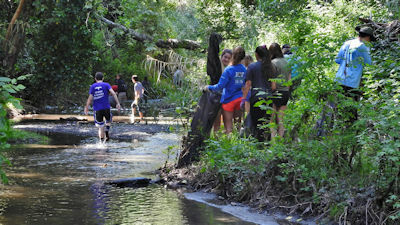 A member of Friends of San Ramon Creeks with GIS expertise led this effort. DVC provided assistance with drones. Second, much of the land along creeks is in private ownership, making it essential to reach out to the owners to educate them about arundo removal if our project is to be a success. We have held several meetings to do this, including a watershed-wide evening event at DVC attended by about 100 people. 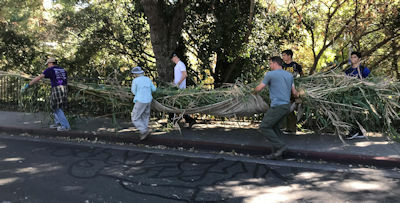 Third, the arundo needs to be replaced by plants, preferably native ones, that are beneficial to wildlife and pollinators and will stabilize the creek banks. Creeks are important wildlife highways. We will begin this work in the coming year. 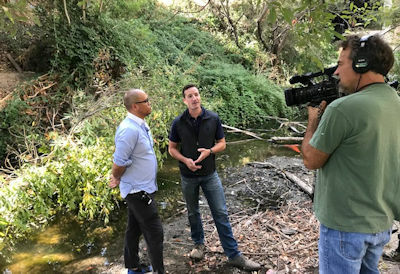 Friends of the Creeks led four arundo removal events in the past year and participated in filming a video which you can see here. Photos from the 2018 creek cleanup are available here. Last March a large group of volunteers sheet mulched a patch of Bermuda grass next to our restoration site. In November, other volunteers weeded the Bermuda grass that had broken through.